May 2007 – Planet Geek! I hate to see a good thing get ruined. 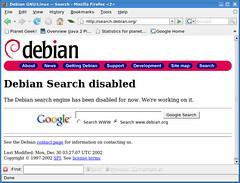 One of my daily joys was waiting until around 1pm when TheDailyWTF would update with a well written story about some workplace / tech related problem that really made the reader go “Wha de FU?” The articles were very well put together, the story behind each posting was interesting and detailed, and it was nice hearing about oddities in the tech sector each day. Around the middle of last year, the writers added a new feature, the “Code Snippet Of The Day”. A sidebar bit of content where code-specific WTF’s were posted and readers would comment on where the problems were and how they might be fixed. I found the CodeSOD entries somewhat distracting – the writing style was stilted and boring, and would classh with the normal content. Then, the site changed it’s name. It was no longer “The Daily WTF” – it was now “Worse Than Failure”. The various reasonings behind this move were shallow and rang hollow. It was simply the next step in a blog owner trying to broaden their content base to be able to provide more diverse content. New posters were brought in, and the article quality dropped precipitously. Instead of one high quality article a day, we had a 3-5 poorly written articles, intermixed with CodeSOD’s. This week they are running “Classics Week”. Now, I’m all for nostalgia. It’s great going back into the archives and pulling out truly outstanding articles from the past and reminiscing. But the authors on TheDailyWTF are doing no such thing. They are posting classic articles from as recent as nine weeks ago. Ladies and gentlemen, a classic is something I may have missed in the distant past, or something that stood above all the others and should be brought back. When doing ‘classics’, you don’t just repost recent articles. This is primarily so I can remember how to do this. I have yawl set up as a postfix host here at Chez Geek, but my smart mailhost is actually off in colocation land. So with my problems with Thunderbird still unresolved, it was time to try setting yawl up as a smarter mail client. First things first, make sure postfix is installed. With Ubuntu, it comes installed by default, but not enabled. Obviously substitute in whatever domain you're using normally for 'name.com'. So it’s no secret I’m a screaming fan of Robot Chicken, and introduce folks to it whenever I can. RC has been doing various star wars spoofs for a while, but now they apparently have their own special coming up. Adult Swim’s “Robot Chicken” travels to a galaxy far, far away to create an all Star Wars-themed special. Premiering on June 17, “Robot Chicken: Star Wars” brazenly combines the satirical sensibilities of Seth Green and Matthew Senreich’s (Stoopid Monkey Productions) “Robot Chicken” with the unforgettable moments and favorite characters of the Star Wars universe — among them, its creator himself, George Lucas. Transformed into the stop-motion animated characters that are the hallmark of Adult Swim’s “Robot Chicken,” and in conjunction with ShadowMachine Films (Alex Bulkley/Corey Campodonicos), the Star Wars galaxy takes on an entirely different attitude. The site also has a link to the trailer for the special. There’s a lot of material that’s already been shown on RC, but a lot of new stuff as well. Can’t wait! Edit – ah, here’s the link to the trailer.